(PSC) TO USF-I OPERATIONS ORDER 10-01. (U) TIME ZONE USED THROUGHOUT THIS PUBLICATION: CHARLIE (C). AND PERSONAL SECURITY DETAILS (PSD) TO PRIVATE SECURITY CONTRACTORS (PSC). UPDATES WITH A MONTHLY COR REPORT TO JCC-I/A. 3.B.1. (U) ALL MSC’S AND SEPARATES. MONTHLY THERE AFTER WITH THE MONTHLY COR REPORT TO JCC-I/A. 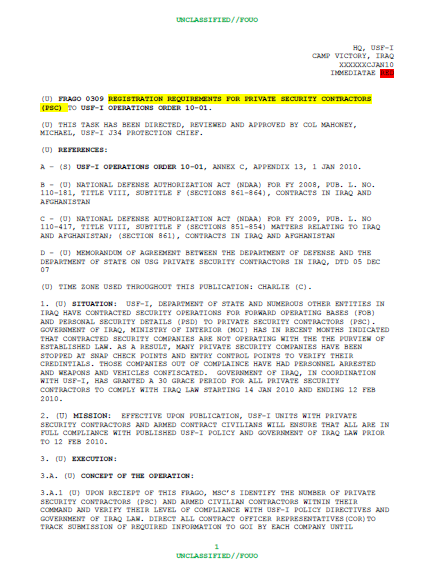 NON-COMPLAINCE TO USF-I ARMED CONTRACTOR OVERSIGHT BRANCH (ACOB). SUBMITTED AND STRICT MONITORING BY CONTRACTING OFFICERS (KO). JCC-I/A, AND FORWARD TO J3 AND COMMAND GROUP WITH ANALYSIS OF ANY ISSUES. PRIVATE SECURITY CONTRATORS WHO HAVE SUBMITTED THE REQUIRED DOCUMENTS. FURTHER ASSESS STATUS OF GOI PROCESSING MOI EMPLOYEE ID AND WEAPONS CARDS. 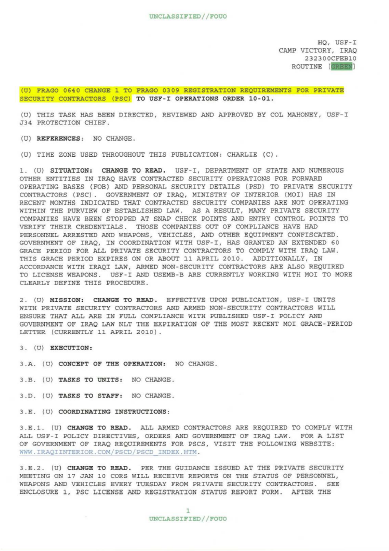 SECURITY CONTRACTORS (PSC) TO USF-I OPERATI ONS ORDER 10- 01. (U) REFERENCES: NO CHANGE . (U) TIME ZONE USED THROUGHOUT THIS PUBLICATION : CHARLIE (C) . PERSONNEL ARRESTED AND WEAPONS, VEHICLES, AND OTHER EQUIPMENT CONFISCATED . GRACE PERIOD FOR ALL PRIVATE SECURITY CONTRACTORS TO COMPLY WITH IRAQ LAW. CLEARLY DEFINE THIS PROCEDURE . LETTER (CURRENTLY 11 APRIL 2010) . (THERE IS CURRENTLY NO MECHANISM WITHIN THE APPLICATION PROCESS FOR THIS) .